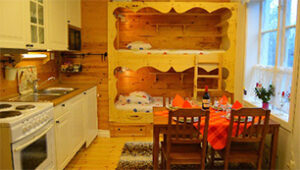 The Canoe Trail Nittalven curls through a deep and beautiful pine forest. The forest is located on top of a bank of sand. 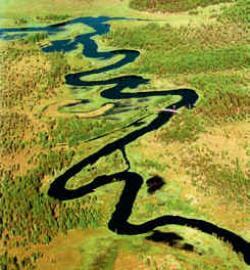 At some places, the river has broken through and continued straight forward instead of taking its old, meandering path. The remains are small oxbow lakes. The flipside of the coin, however, is that the river is impassable when the water level is normal. The whole length of the Canoe Trail Nittalven is only passable in spring or after long periods of heavy rain, when the water level is very high. The spring canoeing along the Canoe Trail Nittalven an average year: The time to paddle the Canoe Trail Nittalven is in April. Recommended is to schedule the paddling the two middle weeks in April. These two weeks are the safest weeks as the start of the snow melting sometimes differ from year to year. 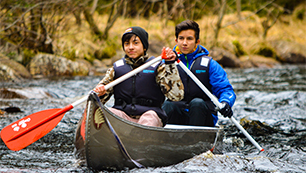 Canoeing and kayaking along the whole length of the Canoe Trail Nittälven should not be planned after April (a spring with average snow melting conditions). The canoe trail Nittalven is always best right after the ice has been released. A date that always varies and which is dependent on the current snow melting. Nordic Discovery has full control on the snowmelting prosses and we will advise the predicted snow melting forecast at the end of March 2019. 190424: The spring canoeing in flowing water with easy rapids is nearly over, but it is still OK to start before the rapid at Kolbron. Degree of difficulty: Medium difficult due to some fallen trees. Uvbergsbron-Kopparberg: 43 km, 85% river paddling. Uvbergsbron-Ljusnaren: 23 km, 100% river paddling. 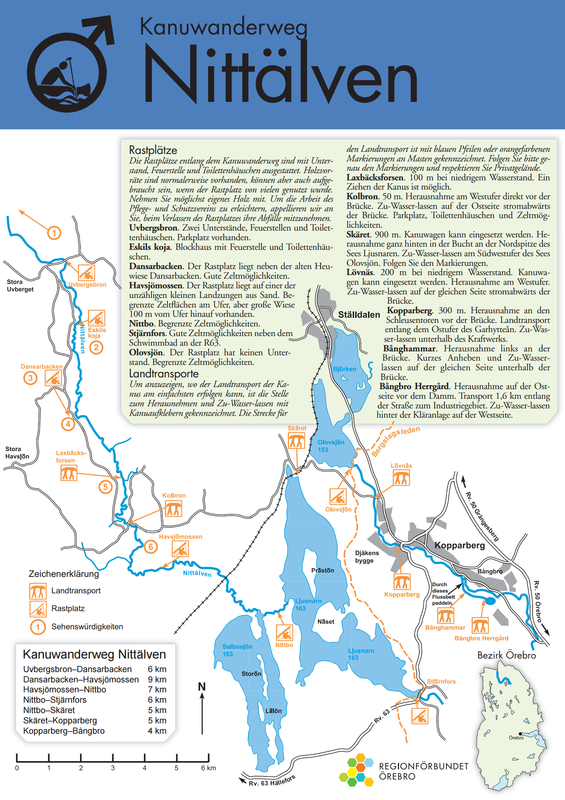 Kolbron-Kopparberg: 27 km, 65% river paddling. Havsjömossen-Kopparberg: 24 km, 60% river paddling. Drop: 17 m total, 40 cm/km on average. Portages: At high water level the first two portages offer nice white water paddling. 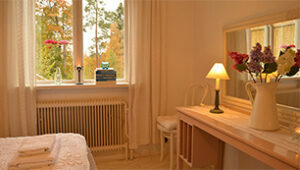 In this case there are no portages until after the lake Ljusnaren. Landscape description: Wilderness until the lake Ljusnaren. 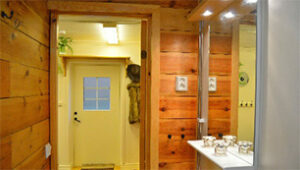 The rain and wind shelters have good, strong fire places, dry toilets and sometimes even firewood. The canoe trail continues to Garhytteån (Arbågaån Norra) via a portage 400 m in length. 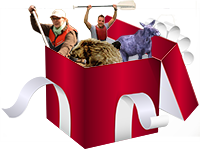 A good canoe trail description with map is included in the hire of equipment. 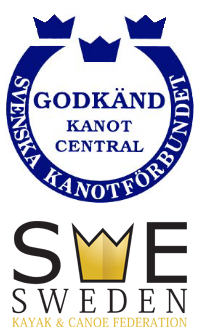 Free transport of hired equipment for hires over 3000 SEK/transport day. Kopparberg: Free transport of hired equipment for hires over 2400 SEK/transport day. Finish: Skäret (or Djäken's swimming place). Lunch: Along the canoe trail. Camping: Storsand (at the north-west shore of Salbosjön). Camping: At the rain and wind shelter at Olofssjön. Lunch: At Zara's pizzeria which is located at the portage in Kopparberg. Finish: Just before the river forks in Bångbro. 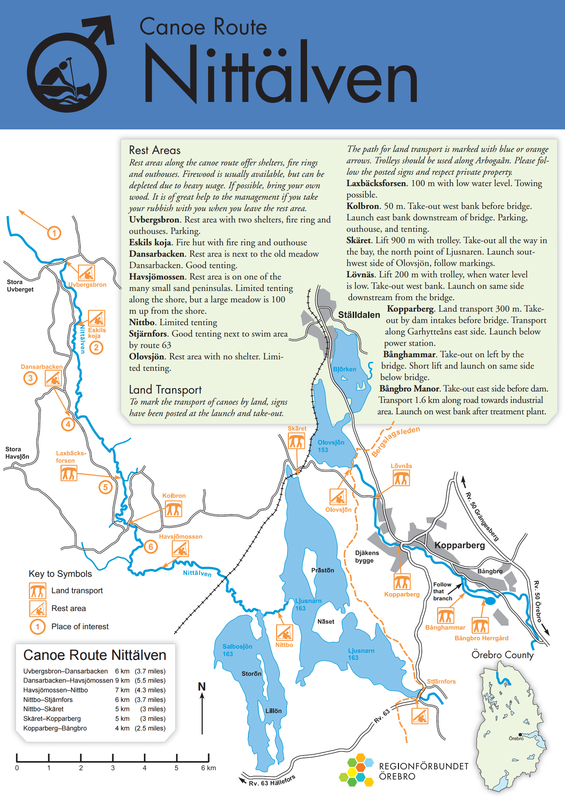 Where to start canoeing along the Canoe Trail Nittalven in relation to the current water level? 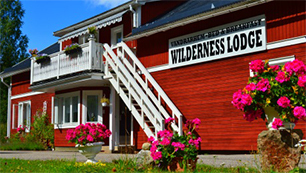 Just before the division of the river in Bångbro (South of Kopparberg), Nordic Discovery has a branch rental where it is possible to leave canoes and kayaks. If you choose to finish your trip and leave your material there only transport of canoes and kayaks to the starting point is needed. Specified times for the return of rented material may occur. At normal and low water level, the lower part of of the canoe trail Nittalven can still be paddled, with start 1 km south of Kolbron, from there he canoe trail Nittalven is always passable, and the paddling down to Ljusnaren makes a nice one-day paddling trip. 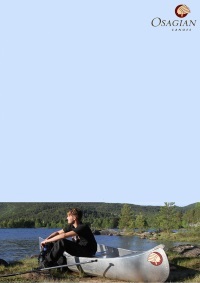 To extend the paddling to two days, it is recommended to paddle down to the untouched lake, Salbosjön. Another alternative is to paddle from Ljusnaren up to Havsjömossen on Day One, and back to Ljusnaren on Day Two. 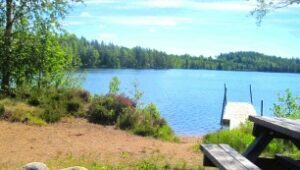 A good place to finish the trip and park your car is at Djäken's swimming place, at the east side of the lake, Ljusnaren. 600 SEK/canoe and kayak /transport day. 350 SEK/canoe and kayak/day without transport. The price applies to full group discount of the costs of canoe transports to and from Nittälven. 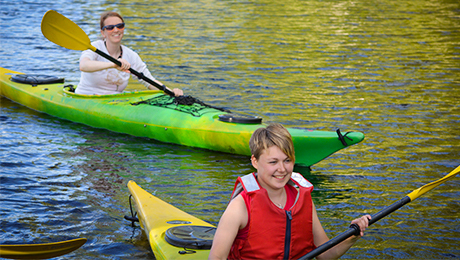 With bookings of low numbers of canoes, please check the price list for canoe transport before booking. 175 km: Paddle from the Canoe Trail Nittalven's sources all the way to the lake, Hjälmaren (Canoe trails 5-9). 175 km of exciting paddling, which should be paddled over 2.5 weeks. 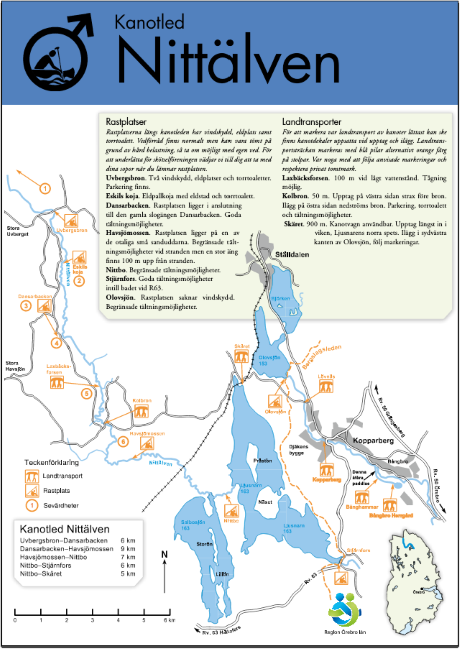 The the Canoe Trail Nittalven continues all the way down to the lake, Mälaren, but changes name several times. 300 km: Paddle from the Canoe Trail Nittalven's sources all the way to the lake, Mälaren (Canoe trails 5-8). Paddle through Mälaren (10) and paddle the Strömsholms kanal (11) upstream. 300 km of exciting paddling, which should be paddled over 4 weeks. The stretch from the Canoe Trail Nittalven's sources to Mälaren or Hjälmaren (Canoe trails 5-8/9) should not be undertaken whithout a saw and a big portion of adventure guts.